NYCAviation visited gorgeous San Francisco this past weekend for the Fleet Week 2010 Airshow. AirTran Airways has announced new routes between Baltimore-Washington International Thurgood Marshall Airport in Baltimore, MD and Jacksonville International Airport in Jacksonville, FL. Service begins on May 4, 2010. Condor will be starting flights between Frankfurt, Germany and Fort Lauderdale, Florida, beginning May 14, 2010 with Boeing 767-300 aircraft. 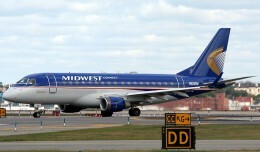 Midwest Airlines has announced new routes to Raleigh/Durham, NC and San Francisco, CA. Service to Raleigh/Durham beginning next April.